The front cover displays the author's name and book title in large dark blue-to-green print. The illustration depicts a human skull missing the jawbone, superimposed on a Navajo rug, in front of a stylized red mesa, sky, and cloud landscape with a police car near the right edge of the drawing. Other cover text includes "Bestselling author of SACRED CLOWNS and A THIEF OF TIME" and praise for Skinwalkers. The back cover text is bracketed by drawings of plant-like pillars with characteristics of corn, topped by horizontal Yei figures. 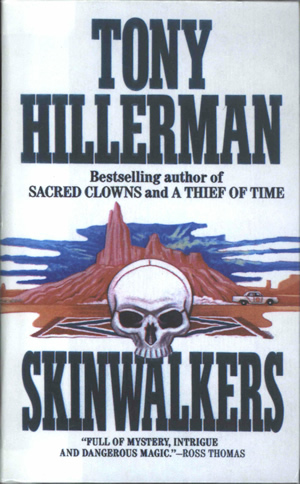 The text is a synopsis of the novel with praise for Tony Hillerman and Skinwalkers from the Los Angeles Times, and the Turtleback logo and trademark. The title and author name are printed horizontally in dark blue to green print on the spine, below a detail of the skull from the front cover and the HarperTorch logo and fiction designation. The inside front and back covers are blank, and the endpapers are white.